Everyone has seen photos of Michelangelo's David, but unfortunately the sculpture is invariably shown from the side view, rather than from the front. The image on the the right is an actual frontal view of David, as he coolly yet menacingly awaits Goliath, his sling at the ready over his shoulder and his face full of disdain. With this lighting, he actually appears to be sneering at the giant. The message of the sculpture is clearly, "You [Goliath, and by extension, Caesar Borgia and any other potential enemy of the Florentine Republic] are dead meat!" No living person has ever seen or photographed this primary view of the world's most famous sculpture. 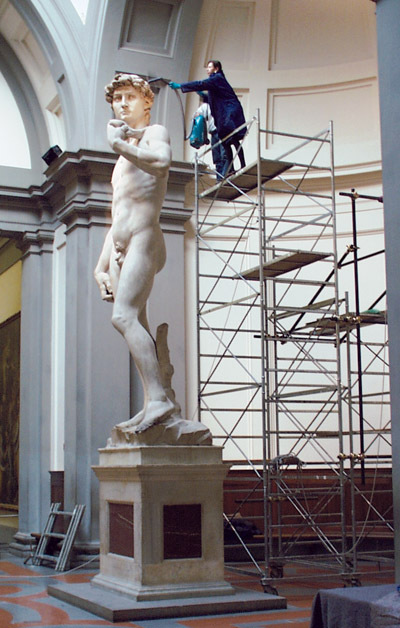 Since 1873, the original of David has been in the Galleria dell'Academia in Florence, but it was originally turned so as to face into a nearby column, and has been left in that position ever since. In order for anyone to obtain the frontal view of the actual statue, they would have to stand well behind the column, and then use X-ray vision to see through it. Now, however, thanks to Stanford University's Digital Michelangelo Project, it is possible to obtain virtual views of David from any direction, even through the impeding column! The image shown at right was created with the Project's ScanView software, and is shown here with the kind permission of the project director, Prof. Marc Levoy. The ideal orientation of the sculpture would be to turn it about 80 degrees clockwise from its present position, so that visitors can appreciate its full impact as they approach it down the long sculpture gallery. Voyeurs who are more interested in David's anatomical details than in his iconography would still be able to obtain fully gratifying views from the left (and right) side rooms, provided it were also pulled forward into the transept. Dr. Pietro Antonio Bernabei of the Careggi hospital in Florence and Prof. Massimo Gulisano, an anatomist at Florence University, recently announced that every detail of the sculpture "is consistent with the combined effects of fear, tension and aggression," (Hooper, 2005). According to an interview with Bernabei, everything is "consistent with a young man 'at the moment immediately preceding the slinging of a stone.' His right leg is tensed while the left one juts forward 'like that of a fencer, or even a boxer.' Tension is written all over his face. His eyes are wide open. His nostrils are flared. And the muscles between his eyebrows stand out, exactly as they would if they were tightened by concentration and agression." These features of the sculpture are best appreciated in terms of the long-lost frontal view newly depicted here. The tension of the moment even accounts, according to Bernabei, for "a contraction of the reproductive organs," which has puzzled many observers in the past. Note that the base is aligned about 10 degrees from the sculpture itself, thereby enhancing its dynamic effect. This alignment may also reflect the orientation of the block from which Michelangelo worked. Aligning the statue to face down the sculpture gallery would therefore require placing its base, and therefore its traditional pedestal, at an angle to the building. This might have offended 19th century concepts of symmetry, but today it would be taken in stride. If you want to try different views of David for yourself, the ScanView software and David data base may be downloaded for free from the ScanView website. Enlarge the ScanView window to full screen, and then drag with your left mouse button to turn the figure. Ctrl + left button moves the viewpoint in and out, the right mouse button moves the image up and down, and Ctrl + right button moves the light source. Unfortunately, only a PC version is available at present, and there is no way to hold the size of the image constant while changing the distance of the viewpoint. A photo from the much more accessible viewpoint just left of the round column on the left in this photo, taken by the Digital Michelangelo project, is available online at graphics.stanford.edu/projects/mich/david/scanning-david1/dusting2-s.jpg. From this perspective, however, it is much less obvious from David's eyes that he is taking aim at something, than when he is viewed from the right of this column, through the gap. According to a webpage of the Stanford Computer Graphics Laboratory, when the head of David is viewed head-on, "the gaze direction of his two eyes actually diverge pathologically." A recent article by Saad Shaikh MD and James Leonard-Amodeo in the Journal of the Royal Society of Medicine confirms that David is portrayed as "exotropic," stating that "the left eye fixates on the viewer, while the right eye appears to be looking at the distance away from the viewer." Indeed, David does appear to have divergent eyes in the photo and computer image of his head shown at http://graphics.stanford.edu/projects/mich/color-david/color-david.html. However, the photo (on the left) must surely have been taken from in front of the column, and therefore quite close to David's face on the scale of the sculpture. The computer image (on the right) has the same appearance, and therefore must have been generated from the same virtual distance. If David were looking at a giant in the distance, his eyes would naturally appear to be diverging to a close-up viewer, just as he would appear to be cross-eyed if he were focussing correctly on a fly buzzing over his nose. Unfortunately, there is no way at present to use ScanView to move the viewpoint backward in order to check the alignment of his eyes when viewed from a considerable distance without at the same time having the image appear proportionately smaller. 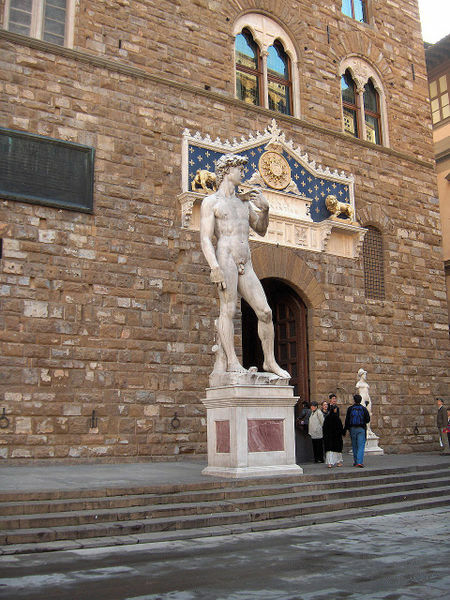 The statue stood in front of the Palazzo Vecchio in Florence from 1504 until it was moved to the Galleria. There, it was turned so as to face south toward the Uffizi colonade rather than outward into the Piazza della Signoria. In 1910, a modern copy (which is regarded as inferior) was placed in the same position the original had once been. A photo of the copy is shown below. Modern copy situated like the original outside Palazzo Vecchio. Photo by JoJan from Wikimedia Commons. aspects that are active, aggressive and even menacing. These culminate in the head with its terribilit� and intensely staring eyes directed to a dangerous and threatening Goliath. In the political crisis of Florence during this period, there can be little doubt as to which forces constituted the symbolic Goliath. Although the immediate danger of Borgian expansionist policy had abated by the time of the 1504 meeting, the republican elements were still disturbed by the considerably increased power of the Medicean exiles who were always intriguing to overthrow the anti-Medicean Signoria and restore their depostic control over the city. Where the energies of the Medicean Goliath continued to be expended in anti-Florentine schemes was to the south, in Rome. In front of the Palazzo Vecchio where it was ultimately placed, David did indeed engage its Goliath to the south. Its head constitutes its most meaningful and expressive feature, full of symbolic political associations that had significance for contemporary viewers. The placement of the figure obviously determined the direction of its gaze, and as a result the orientation of head and face was undoubtedly a factor influencing the choice of site. it would also direct its menacing aspects against the Florentines. "It is not for such a thing to go towards the passerby." The David should, instead, "go" against the enemy; nor should the malevolent stare of its head be turned upon the loyal citizens of the republic ("nor should the figure come to look at us"). The language that Il Riccio uses underscores our impression that he sees the work as imbued with an almost magical sense of apotropaic [evil-averting] potency. It is in this context that he uses the dramatic phrase, "such a thing" (tal cosa); a remarkable phrase, indeed, to describe what for the modern viewer, may be seen essentially as a "work of art." (Levine 1975). By turning the statue southward toward its intended target of Rome, however, rather than outward toward the Piazza, the menacing pose was apparent only to those who took the trouble to look for it. 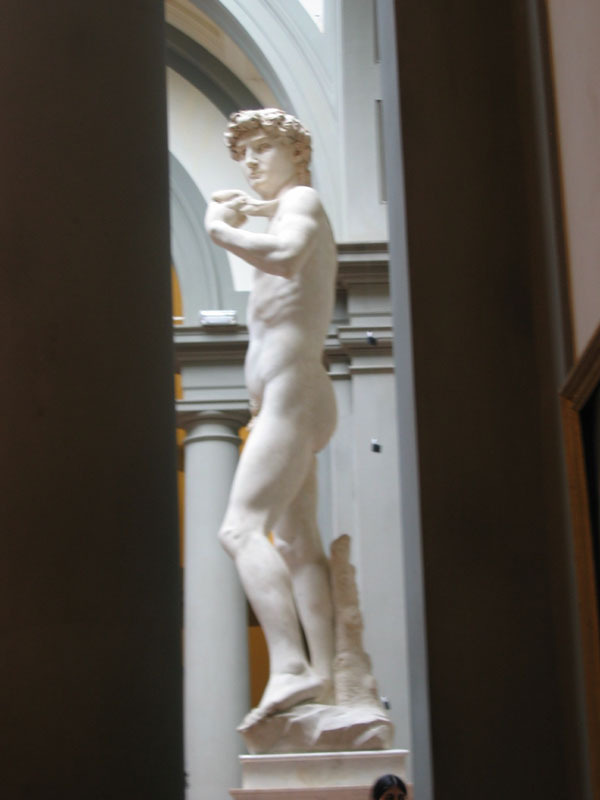 Part of the genius of the statue is that from the westward, or Florentine point of view, David is transformed from a Remorseless Killing Machine into a splendid, yet serene young man who could well be contemplating his sheep, composing a Psalm, or even heading for a dip in the pond, his towel slung over his shoulder. Side, or ventral view of David. Photo by Rico Heil from Wikipedia David article. In light of Levine's article and Il Riccio's comments, it is conceivable that the 1873 decision to face the sculpture impotently into a column where the visitor could never see it head-on might actually have been a deliberate political decision rather than a mere curatorial blunder: Just three years earlier, Rome had been forceably incorporated into the Italian state and made into its capital. Removing David from the Piazza and turning his hostile gaze out of public sight altogether might therefore have been a deliberate gesture of reconciliation toward Rome, in the spirit of the New Italy. Unfortunately, Levine does not comment on the statue's orientation in the Galleria. According to l'Accademia's website, the statue was not just plunked in a pre-existing space. Rather, the gallery was extensively remodeled, specifically to enshrine the sculpture, following the design of architect Emilio De Fabris over the course of 1873-1882. It would be interesting to learn if there was any debate about the orientation at that time, or if it was just taken for granted that the side view should go forward. It should be noted that Levine erroneously refers to the famous side view of the statue that was originally turned toward the Piazza as its front. In fact, the primary definitions of front are I. Forehead, face, and II. That which confronts. The adjective frontal means pertaining to the forehead or frons. (Merriam Webster Second Unabridged Dictionary.) Clearly, the confrontational head-on view depicted above is the true front of the sculpture. Strictly speaking, the famous side view shown to the left is ventral, and not frontal at all. It would be possible, as an experiment, to obtain the frontal view of the statue itself without actually turning it, simply by placing a tall mirror on the column in question. If the image were directed into the left side room, the front would be viewable there, but only in mirror image. If instead it were directed onto the column's mate on the forward side of the right side room, and a second mirror placed on that column, reflecting into the left side room, it would be viewable there in its true orientation. Those who wanted a closer frontal view, albeit reversed, could still obtain it by standing between the two mirrors. This plan would be easy to implement, and would not even take any floor space for the mirrors. From the conventional side view of the statue that Stone undoubtedly had in mind, David does appear to be lost in thought as he gazes off into the distance. From the long-concealed frontal view depicted above, however, it is clear that the only decision David is making is when to release his stone and where to place it. Contra Stone, he is already committed irretrievably to the battle. Stone also insists repeatedly that David is holding the stone in his right hand. If we may assume that David is right handed, he would in fact be holding the ends of the sling-straps in his right hand, while the pouch containing the stone would be held ready with his left hand. If he were instead a southpaw, his right shoulder would be facing his target, as any pitcher would know. Stone would have David actually "strangling" the lions and bears with his bare hands, but merely "smiting" them to death (presumably with a club or stone) while holding them by the beard as in the above translation would require both the strong, massive hands and the completely fearless gaze that we see in the sculpture. David's sling is, admittedly, rather unusual. In antiquity, from Egypt to the Andes, slings have been made with a finger-loop (or occasionally a wrist-loop) to retain the sling after the stone is released. However, a close examination of David's right hand with ScanView reveals no finger loop or wrist loop of any kind. Instead, there is some sort of T-shaped handle, like that on certain corkscrews, in his right hand when viewed from above. It would be rather awkward to hold onto this handle on the retention strap while simultaneously letting go of the release strap. However, "Glenn G."'s contribution to the Slinging.org Member's Gallery does have a similar T-shaped handle on the retention cord, so evidently there is some way to make it work. A further problem is the strap itself. Most slings are made with braided fabric cords, according to the Wikipedia article on slings. David's broad strap would create air resistance that would slow down the turn(s), at the same time that it would generate turbulence that would impair the accuracy of the shot. Yet another problem is that his sling is rather long. According to the Wikipedia sling article again, the two standard methods of slinging a stone are overhand with a vertical turn (for power and accuracy), and underhand with a vertical turn (for sheer distance). Side-arm slinging (with a horizontal turn or turns) is not unheard of, but takes too much space in military ranks, and tends to be less accurate than overhand. Yet on me (I am 71 inches or 180 cm. tall), David's sling would measure about 40 inches (102 cm.). This is about 12 inches (30 cm.) too long to clear the ground on a vertical turn. David must therefore have been a side-arm slinger, using a longer sling to obtain more power than could be obtained with an overhand turn, while at the same time retaining accuracy by dint of his great skill. Coming from a background as a solitary shepherd, he would not have to worry about beaning nearby comrades with a wide horizontal turn. Many of the avocational slingers depicted on Slinging.org are in fact side-armers, as is even their logo. Furthermore, being unusually strong, David must have preferred to use a larger stone than usual, and hence required an unusually strong sling, with heavy leather straps. The second strap must just be precisely hidden from view, or perhaps is simply a thinner, braided leather release cord lying under the heavy retention strap. took his staff in his hand, and chose five smooth stones from the brook, and put them in his shepherd's bag or wallet; his sling was in his hand, and he drew near to the Philistine. David put his hand in his bag and took out a stone, and slung it, and struck the Philistine on the forehead; the stone sank into his forehead, and he fell on his face to the ground. Yet where is the "shepherd's bag or wallet," containing the other four of the famous "five smooth stones"? Or even his staff? In the preceding verse, David rejects the offer of Saul's armor, since he is not used to such equipment. But surely this would leave him wearing a tunic or at least a loin cloth, and not entirely naked, like a Greek soldier. We can only conclude that Michelangelo's David is more Hellenistic than Biblical in at least some of its details. Hooper, John, "How David shrank as he faced Goliath," Guardian Jan. 22, 2005. Online at http://www.guardian.co.uk/italy/story/0,12576,1396034,00.html. Levine, Saul (1974). "The Location of Michelangelo's David: The Meeting of January 25, 1504, The Art Bulletin 56: 31-49. Levoy, Marc, director, The Digital Michelangelo Project, online at http://graphics.stanford.edu/projects/mich/. ScanView: a system for remote visualization of scanned 3D models, online at http://graphics.stanford.edu/software/scanview/. 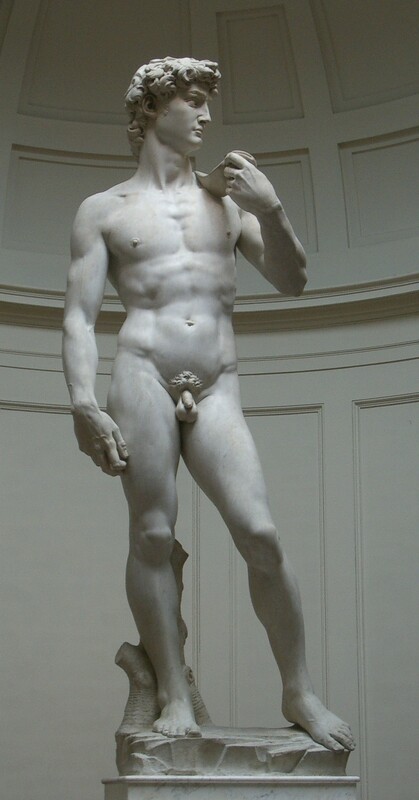 Shaikh, Saad, MD, and James Leonard-Amodeo, "The deviating eyes of Michelangelo's David" Journal of the Royal Society of Medicine 98, Feb. 2005, pp. 75-76. Online at http://www.jrsm.org/cgi/reprint/98/2/75.pdf. Stanford Computer Laboratory, "A 3D computer model of the head of Michelangelo's David," 1999, online at http://graphics.stanford.edu/projects/mich/head-of-david/head-of-david.html. Stone, Irving (1961). The Agony and the Ecstasy Doubleday & Co., New York. Wikipedia, "David (Michelangelo)" online at http://en.wikipedia.org/wiki/Michelangelos_David. Note -- A new blog, "The Unremarked Menace of Michelangelo's David" by Lawrence Auster, discusses this webpage. The computer-generated image above and to the right may be copied and reproduced only with the express permission of Stanford University's Digital Michelangelo Project, and with credit to J. Huston McCulloch and a link to this site for having generated it. The photo above and to the left may be freely downloaded and copied, with photo credit to J. Huston McCulloch and a link to this site.